Powermaster, Doorking, FAAC, OSCO/Linear, Viking, Apollo, SEA. 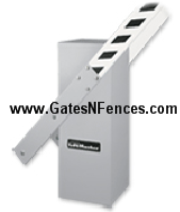 The Mega Arm and Mega Arm Tower Vehicle Barrier Gate are DC-powered additions to the LiftMaster® family of gate operators. situations. Available with three sizes of arms and two cabinet colors. how and when the arm comes down in traffic control situations. 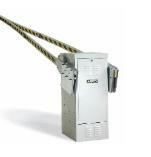 Open/Close Switch on Control Panel Systems, Automatic Closing Timers, 7 Loop Detector Stations. coupled to a spring balancing. 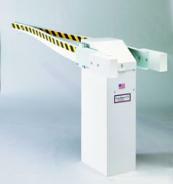 The hydraulic locking feature allows the barrier to be locked in the open and closed positions. Manual Release In case of a power failure, the operator’s internal locking can be released using a special key. gear head motor, and Soft-start / soft-stop operation with an adaptive learn algorithm. used for commercial continuous duty operation. 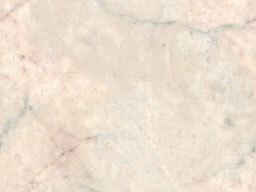 It is ideal for private, public and industrial applications. With a sleek look and innovative break-away arm design the signo will handle all your barrier arm needs. features. The recommend arm lengths are up to 12ft. arm lengths are up to 20ft. will automatically raise the arm in the event of a power outage. raising aluminum beams from 13 to 23 feet long in as little as 4 to 7 seconds. closing. 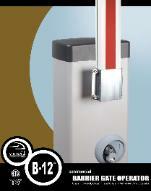 A heat sensor monitors the opener temperature, switching on a cooling fan when required. control logics: automatic, semi-automatic and car park (P), the latter specifically designed for automatic car lots. 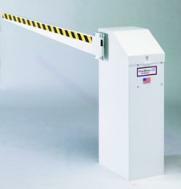 * Flexibility - The 640 can be outfitted with a skirt to stop unauthorized entry under the barrier arm. and stay open until reset. additional cars from entering a specified area prior to the previous car leaving. controls, single- and three-button control stations, digital keypads, coded cards, sensing loops and telephone entry systems. recommended to use two model BGU 12, one on each side of the driveway. allow for various methods of control. overload protection. Motor shall be resiliently mounted for quiet operation.